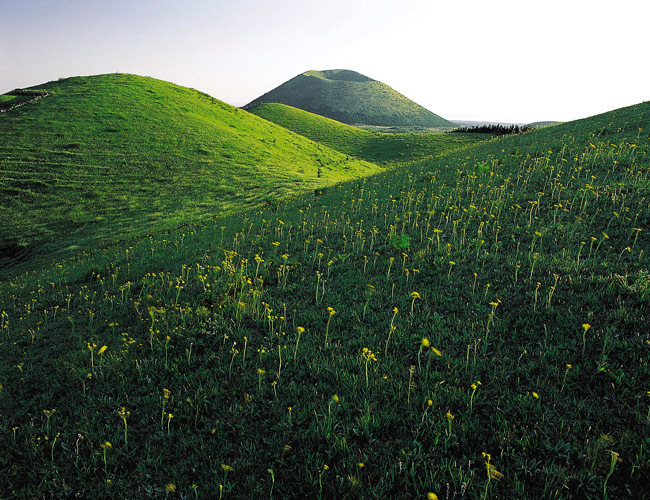 ▲ Jeju’s landscape is dotted with more than 300 parasitic volcanoes, more poetically called oreums. They are a favorite with recreational hikers. Photo courtesy Jeju Provincial Government. If you want to delve deeply into the heart of Jeju and its culture, hike up an oreum. For tourists or newcomers, oreums are often just geological features of the Jeju landscape, a sign of the island’s turbulent volcanic origins. But oreums also exemplify the distinctive features of Jeju’s nature, and the ups and downs of its equally turbulent history. What seems like never-ending stretches of rolling hills dotting the entire island represent a tangible link to Jeju's natural uniqueness, rich culture and long history. Some oreums, such as Geomun oreum, have taken on new significance since UNESCO's designation as World Natural Heritage sites, while others are colorfully decorated with the island’s myths and legends. Others are of great historical significance in themselves. Darangsh oreum, for instance, is a reminder of the tragic history of the 1948 April Third Uprising, in which about one-third of Jeju men were believed to have been killed by government troops. The remains of a large massacre were discovered in a cave at the foot of the oreum. Jeju people pause to poignantly remember, while climbing up and down the oreums, those ancestors who hid in them without being able to escape the bloody slaughter. Oreums are entwined with the daily life of Jeju people and also with comfort and even hope. Cattle graze on the lush wild grasses, crops are often planted in the lee side of an oreum, and many tombs are situated on or at the base of oreums, creating Jeju's landmark landscape. The water of many village wells bubbled up from deep inside the oreums. Many first-time visitors to oreums are pleasantly surprised and also quite impressed at the different vistas of Jeju that oreums provide from what they see from the land, sea, or sky. While some "postcard pretty attractions" turn out to be disappointing when seeing them up close, oreums, which have remained largely pristine for long, long years are wholly new natural gems. Scientifically speaking, oreums are simply secondary volcanic cones. Each of Jeju’s more than 360 oreums, however, has a unique geological feature. Some scientists say they run the gamut of geological and physical features, from the Abu oreum with its gentle sloping sides, Seongsan Ilchulbong IS A TUFF CONE AN OREUM?? 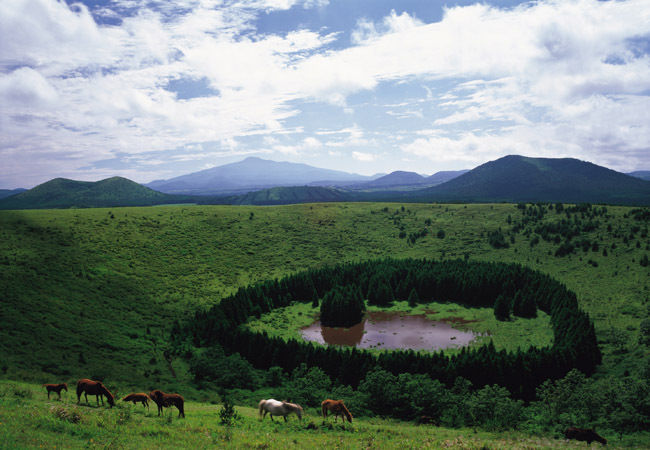 with its massive plateau facing the sea, to Sanjeong Hosu, an Oreum with a tranquil crater lake at its summit. Especially popular for locals and foreigners is Sebyeol Oreum, which is set ablaze during the Lunar New Year Fire Festival every winter. The festival dates back hundreds of years to when farmers burnt their grasses to exterminate insects, rid their land of diseases and wish for bountiful crops in the next year. Oreums are small enough to climb within two hours, but fascinating enough to lose track of time while enjoying the panoramic view of Jeju from south to north, and from west to east. Truly, oreums are an integral part of quintessential Jeju.